www.thehuangs.com » Dock it to me! iPhone 4 charger and speaker by Altec Lansing. Dock it to me! 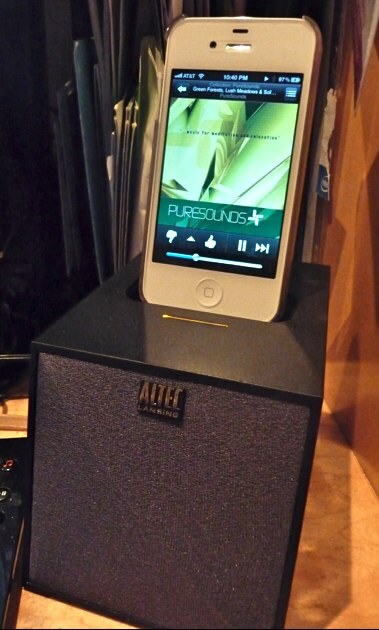 iPhone 4 charger and speaker by Altec Lansing. Here’s my latest new gadget. I was in the market for a new charging cable. The one that I normally use at my desk at home was getting all frayed and ready to bust at any time. If I goto the Apple store, they want $20 for the cable. If I goto Fry’s they have a “compatible” that goes for $7. Surely there must be something in between that would be better and perhaps get me more functionality. Fits perfectly, charges the phone and sounds good too! Now, I’ve been hankering to get some external speakers for my iPhone that wasn’t huge and a big hassle to have around. I started poking around Amazon (where I go for everything these days) and looking for a cable and a speaker. Then a happy accident happened. For not much more than the cable from the Apple Store, I could get an Altec Lansing docking station with a speaker. The reviews were surprisingly good and the measurement showed that is was rather a small box. Now, I am very skeptical of things with very small speakers sounding any good at all. However; anything is better than just cranking up the built in (tiny) speaker of the iPhone. Besides, I was going to leave this sitting at my desk for background music while I worked in the office, so it didn’t need to have wicked bass or anything like that. It just had to sound good at low volumes. So what the heck, I ordered it and thought I could always return it if it wasn’t any good. Boy was I surprised! It has been over 3 weeks now and I can say without reservation that this little speaker / charger / dock really is a great device. As you can see from the picture at the right, it’s a simple unit. I just plug my phone in on top and the little green light illuminates to show me that it’s charging. Easy huh? When I play music (like Pandora) the sound comes through the speaker and sounds really good. In fact, it’s a lot louder than I expected. As you can see in the picture, I usually end up turning the volume way down (about 1/4) and it still has plenty of volume to fill my office. So in summary, I think this is a great little unit that fits the bill perfectly. It was about $28 which is much cheaper than I ever expected and it hardly takes up any space on my desk. I’ve been very happy with this unit. So, if you are thinking about a new cable to leave on your desk for charging, why don’t you notch it up a bit and get a full blown speaker and charger along with it! Just ordered the Altec doc as a little charging station for our guest room. Thanks for the tip ZGM! Hey Kyle, glad I could help. So coming next is a little car mount that has a charger, FM transmitter and a remote. I’ve been trying it out this week and it’s pretty nice. A few odd things, but overall a great deal for what it cost. I’ve been trying to figure out options to integrate iPod functionality into my cars and I didn’t want to get a dedicated kit for each one. Most FM transmitters are useless, but this one has potential…..more later after I have a fully formed opinion. ← Kindle Fire – got it covered!